Belgrade - Netherlands: distance 1682 kilometers via Budapest instead of 1645 via Zagreb. We left at 11.00 and arrived at 02.30 in the morning. With small children in less than 16 hours! Today we bought them small presents because they behaved perfectly during this trip. And it started to snow today. 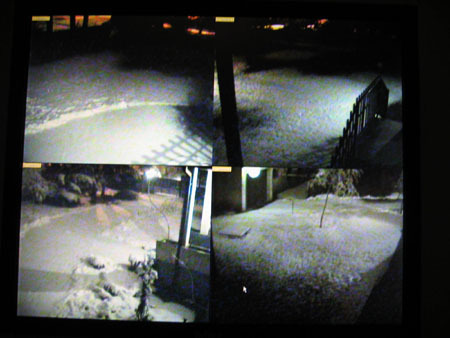 According to the weather forecast we will have a white X-mas! X-mas holiday, and we are waiting for some snow. The weather forecast for Belgrade predicts snow (3 different websites) but so far it is only raining. In the meantime we are working hard to finish the new look which you already discovered by now. recently read that love is entirely a matter of chemistry. That must be why my wife treats me like toxic waste. The last entry for tonight, X-mas. I found some lightbulbs we used in South Korea to put colorful lanterns in our garden during the celebration of Buddha's birthday. 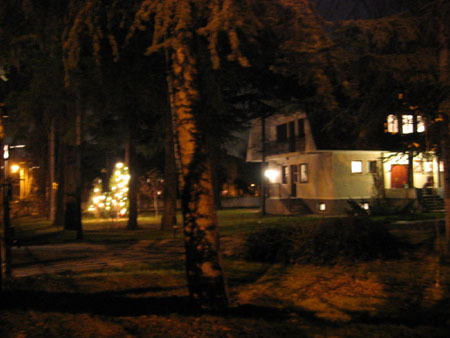 The lanterns are gone now but we have the lightbulbs and enough trees waiting to be decorated. In the Netherlands it is almost a new national sport to decorate your garden with lights in December. In Serbia I did not see special decoration so far. In our neighbourhood we are for sure the first to decorate the garden with lights. 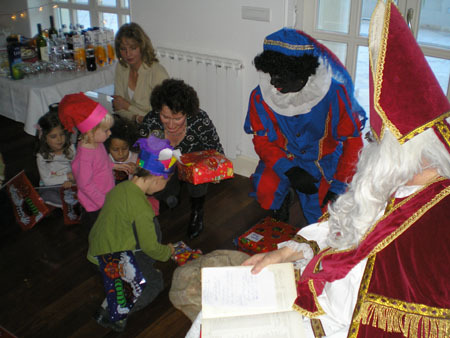 All the Dutch people know 'Sinterklaas' and how important he is for children. For our English readers, read this wikipedia Sinterklaas explanation. 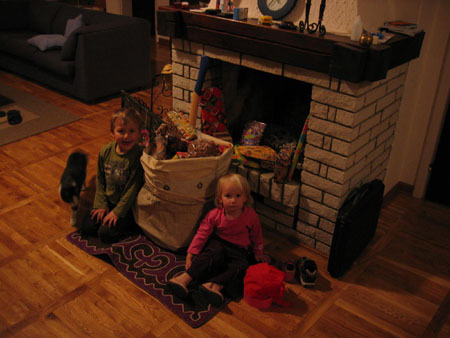 Yde and Vibeke were waiting for Sinterklaas for three weeks. He arrived in the Netherlands but would he find our home in Belgrade? One week ago we heard good news, he would come to Belgrade. All the small Dutch children gathered at the house of the Dutch Ambassador and indeed, last Saturday Sinterklaas had time to stop by on his way back to Spain. Together with one black Peter and a bag full of presents he sure made all the children happy. 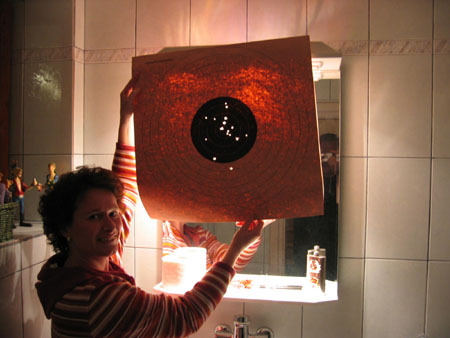 But for Yde and Vibeke there was another big surprise. Sinterklaas left and we went back home. To our surprise the old guy even managed to visit our house. The chimney was easy for black Peter, he probably climbed through the chimney (lucky there was no fire!) to deliver another huge bag full of presents. 'This act puts him on level plane with Ghandi, who fought for independence. On a level plane with Mandela, who fought against the apartheid. Vojislav Seselj is world's pioneer anti-globalist', one of the speakers said said. 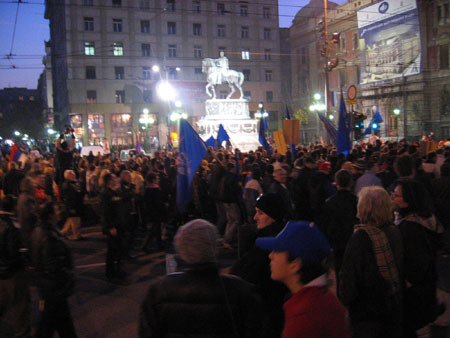 Today there was a protest demonstration going on in Belgrade. 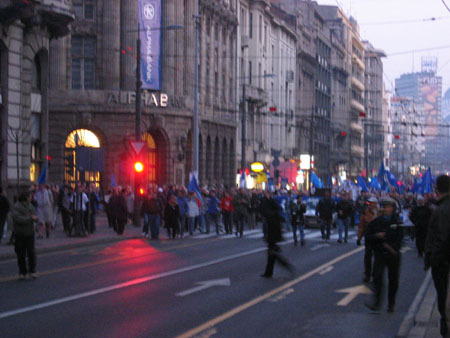 The Serbian radical party organised this rally. They wanted to show their support towards the leader of this party, Seselj, and they protested against the international war tribunal in The Hague. On their own website you can find Seselj his picture and a banner on the left side which looks the same like the posters they spread throughout Belgrade. 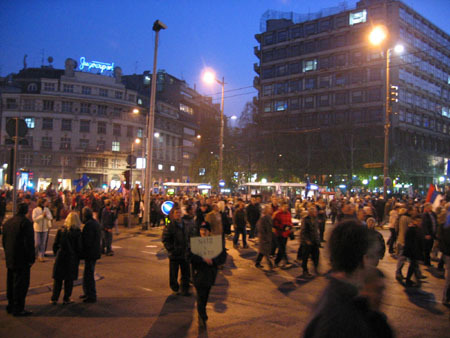 The turbulent political past of Serbia during the Milosevic times saw demonstrations during his downfall as a president. 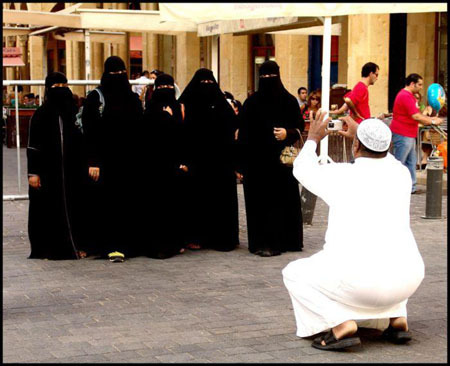 But these people protested in favour of a leader who is charged with war crimes. I guess the best thing to do in Serbia if you are just living here is not to discuss politics with your Serbian friends. Before you know you tumble into a wasp nest of very strong opinions. Today I had to buy presents for our upcoming Saint Nicholas feast. I went to Kozmo, a beautiful toy shop on Knez Mihailova 14-16 (in the basement). Unfortunately they do not have a website, so I can only give the address. After buying lots of presents I strolled along some other shops and my eye caught the sign of UNICEF. I'm always interested in their Christmas cards so I went into the gallery where I saw the sign. 60 years ago Unicef came to Serbia and a photography exhibition shows the history of Unicef. Until december 10 several activities are organized to celebrate Unicef's 60th anniversary. There are film screenings, presentations, discussions and of course a children's corner. Spending to much time in the city made me hurry home because I had to pick up Yde from school and go to a birthday party.